The stability of a residual soil slope is a system of grey and white, and gradual change and sudden change. It is difficult to accurately forecast the instability time of a granite residual soil slope, because the factors affecting the instability of granite residual soil slopes are random and uncontrollable. Using the grey prediction method, the accumulation generation of data weakens the influence of random disturbance factors in the original sequence, and enhances the regularity of data. In this paper, we proposed a grey cusp catastrophe prediction model to calculate the instability time of granite residual soil slopes under rainfall. We took one-time cumulative transformation of the remote monitoring data of slope displacement, and then conducted polynomial regression fitting on the processed displacement data and monitoring time. 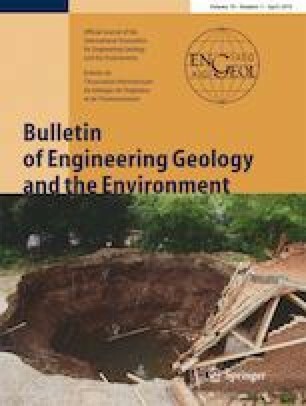 The grey cusp catastrophe instability prediction model of granite residual soil slopes was established using the nonlinear dynamic catastrophic prediction theory. The critical instability time of the slope was predicted using the grey catastrophe instability prediction method presented in this paper. For comparison, we conducted exponential curve fitting on the displacement data and monitoring time, and then established the Saito instability forecasting method of a soil slope to predict the slope instability. Through the engineering application, and using the presented grey catastrophe slope instability prediction method, the slope instability process may be accurately predicted. The calculation results using the grey catastrophe slope instability prediction method presented in this paper are in good agreement with the actual situation. Whether it can be used for other slopes remains to be further studied. This work was financially supported by grants from the Yalong River Joint Fund of National Natural Science Foundation of China and Yalong River Hydropower Development Co., Ltd. (no. U1765110), the Fundamental Research Funds for the Central Universities (22120180312), the National Natural Science Foundation of China (no. 40872179), and the Natural Science Foundation of Shanghai (16ZR1423300).